We are so excited to have you join us for a Sunny blog hop to celebrate! We have designed a great new sentiment builder stamp and die set called Sending Sunshine! This set is exclusive to Honey Bee Stamps and Ellen Hutson LLC for the United We Flourish program. Now for the GIVEAWAY …..Be sure to leave comments on our blog as well as the Ellen Hutson Classrom blog to be entered to win some exciting prizes by 11:59pm PST on Friday, September 8th. 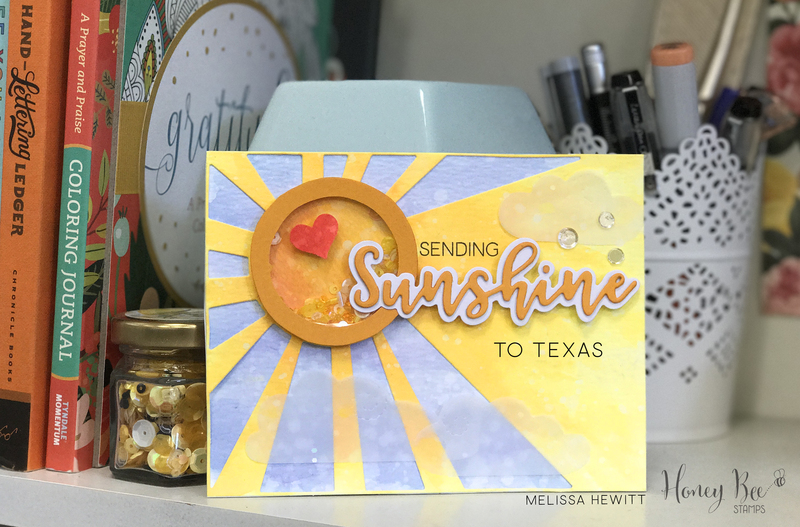 Also, we want to mention that Honey Bee Stamps is Sending Sunshine to Texas. Melissa, the Honey Bee Stamps owner made this gorgeous card in support of this campaign. For the State of Texas and helping with the recovery, we are donating a portion of the sales to the JJ Watt Hurricane Harvey Relief Fund. This fund gives 100% of all donations back to those in need. To see all other Honey Bee Stamps products visit us HERE!